All transactions are safe and secure with a reliable history in online purchasing behind each of our associates. Buy the Back to the Future DeLorean t-shirt to own Back to the Future clothing and merchandise. The front of this Back to the Future shirt features Doc Brown's time machine. Wear it when you need to "make like a tree and get out of here." Do so in your BTTF DeLorean car. Wouldn't it be cool if you had your own DeLorean time machine so you could make like a tree and leave, or go back to the year 1985 and watch the Back to the Future movie on the big screen again? You would of course need a flux capacitor and 1.21 gigawatts of electricity to operate it. If only you could find your way to the future to pick up some more plutonium from Wal-Mart. You can always try to get lucky with a lightning bolt. 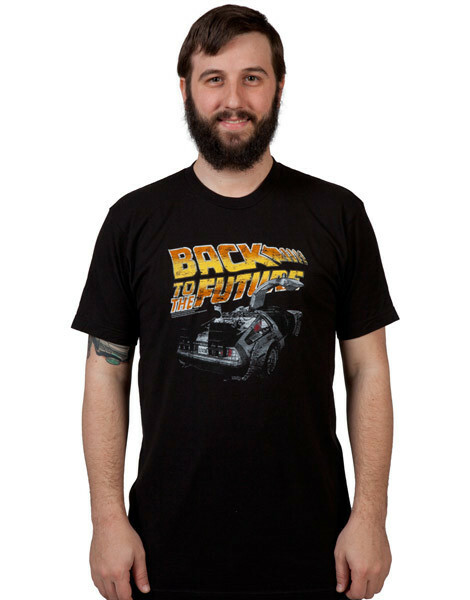 In addition to the Back to the Future DeLorean tee above, browse the Back to the Future Clothing Gallery for more apparel like men's and women's clothes, kids shirts or hoodies.